A specific and communicable disease, characterized by violent vomiting and purging. It prevails endemically in some parts of India, and from time to time is diffused epidemically throughout the world. The mortality is about 50 per cent of all the persons attacked. The first appearance of the disease in Europe occurred in 1817, when it broke out in Lower Bengal and thence spread over Europe, until it disappeared in 1823. Since then the disease has appeared in Europe on six different occasions; viz., in 1826, 1837, 1846, 1863, 1882, and 1892-96. According to all the etiological factors, excepting Alcoholism, of course, the Jews should suffer from cholera more frequently than, or at least as often as, other races. But careful investigation has shown that during most of the epidemics Jews were affected to a lesser degree than non-Jews; indeed, during some epidemics they are said to have shown perfect immunity. During the epidemic of cholera in Budapest, Hungary, in 1851, while the mortality among Christians was 1.85 per cent, that among the Jews was only 0.257 per cent, or one-seventh as great. During the epidemic of 1866 there were in every 100 deaths in the general hospital 51.76 deaths from cholera, and in the Jewish hospital 34.0 only (Tormay). From a pamphlet published in 1868 by Dr. Scalzi, professor of medicine in the University of Rome, it appears that in every 100 attacks of cholera in 1866, the Catholics had 69.13 deaths; the inhabitants belonging to other non-Jewish cults, 42.13; the Jews, 22.0 only. In proportion to the population the mortality from cholera would have been 0.45 per cent for the Jews, and 1 per cent for others. "They [the Jews] do not suffer from the depression caused by habitual intoxication. These circumstances in their favor enabled them during the epidemic of 1849 to enjoy an almost complete immunity from the disease, which raged with frightful violence in the immediate neighborhood of the district where they most congregate, and the sanitary conditions of which, as regards cleanliness, ventilation, etc., were decidedly unfavorable". During some epidemics, however, the Jews are stated to have suffered severely. Thus, according to Hirsch, in Algiers and in Smyrna, in 1831, the Jewish population suffered more from cholera than the rest of the population. 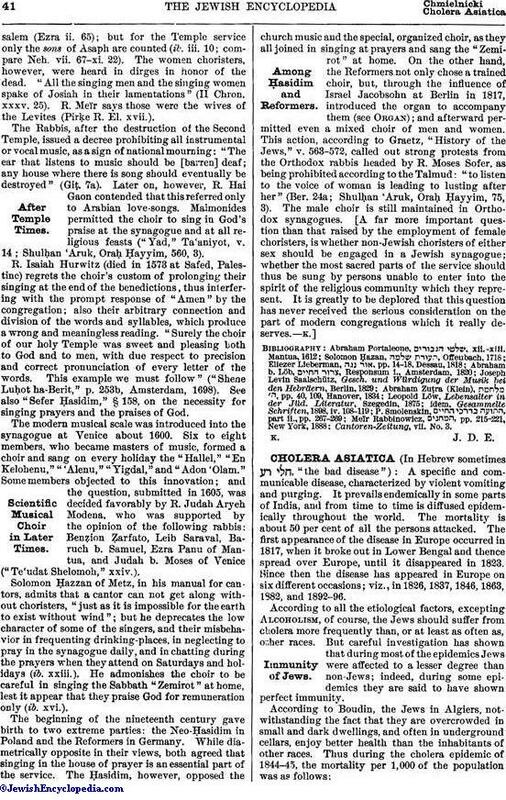 The same was the case in 1831 with the Jews in Poland, Jassy (Rumania), and many other places (Hirsch, "Handbuch der Historisch Geograph. Pathologie," Erlangen, 1851, i. 129). From evidence collected by Boudin the mortality of the Jews during the cholera epidemic in 1831 seems to have been perceptibly higher than that of the non-Jews; but thirteen years later (as shown above) the exact opposite was the case. During the last epidemic of cholera in Europe (1891-96), there is also evidence that in some places at least the Jews enjoyed a relative immunity from the disease. Thus in 1892 in Hamburg, Germany, according to Dr. J. J. Reincke ("Deutsche Medicinische Wochenschrift," 1893, p. 193), during the months of August and September there were buried in the general cemetery 6.4 times the average number of dead for the three previous years; in the Jewish cemetery, only 3.5 times as many. According to Dr. Georg Buschan ("Globus," lxvii. 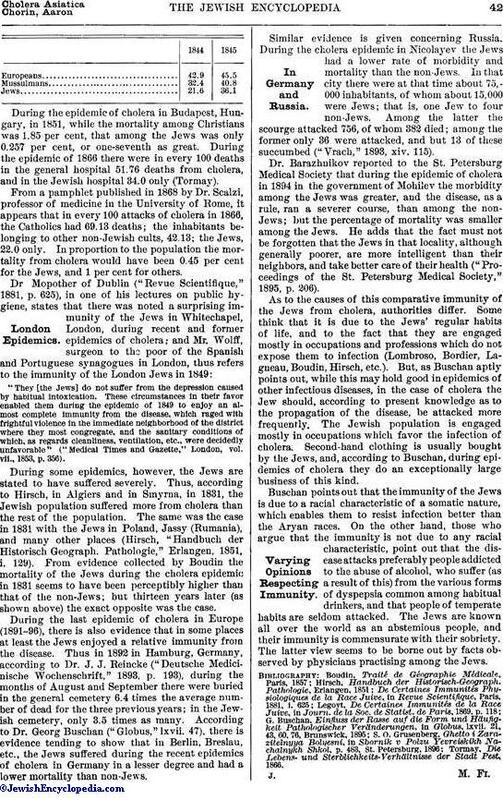 47), there is evidence tending to show that in Berlin, Breslau, etc., the Jews suffered during the recent epidemics of cholera in Germany in a lesser degree and had a lower mortality than non-Jews. Similar evidence is given concerning Russia. During the cholera epidemic in Nicolayev the Jews had a lower rate of morbidity and mortality than the non-Jews. In that city there were at that time about 75,000 inhabitants, of whom about 15,000 were Jews; that is, one Jew to four non-Jews. Among the latter the scourge attacked 756, of whom 382 died; among the former only 36 were attacked, and but 13 of these succumbed ("Vrach," 1893, xiv. 115). Dr. Barazhnikov reported to the St. Petersburg Medical Society that during the epidemic of cholera in 1894 in the government of Mohilev the morbidity among the Jews was greater, and the disease, as a rule, ran a severer course, than among the non-Jews; but the percentage of mortality was smaller among the Jews. He adds that the fact must not be forgotten that the Jews in that locality, although generally poorer, are more intelligent than their neighbors, and take better care of their health ("Proceedings of the St. Petersburg Medical Society," 1895, p. 206). As to the causes of this comparative immunity of the Jews from cholera, authorities differ. Some think that it is due to the Jews' regular habits of life, and to the fact that they are engaged mostly in occupations and professions which do not expose them to infection (Lombroso, Bordier, Lagneau, Boudin, Hirsch, etc.). But, as Buschan aptly points out, while this may hold good in epidemics of other infectious diseases, in the case of cholera the Jew should, according to present knowledge as to the propagation of the disease, be attacked more frequently. The Jewish population is engaged mostly in occupations which favor the infection of cholera. Second-hand clothing is usually bought by the Jews, and, according to Buschan, during epidemics of cholera they do an exceptionally large business of this kind. Buschan points out that the immunity of the Jews is due to a racial characteristic of a somatic nature, which enables them to resist infection better than the Aryan races. On the other hand, those who argue that the immunity is not due to any racial characteristic, point out that the disease attacks preferably people addicted to the abuse of alcohol, who suffer (as a result of this) from the various forms of dyspepsia common among habitual drinkers, and that people of temperate habits are seldom attacked. The Jews are known all over the world as an abstemious people, and their immunity is commensurate with their sobriety. The latter view seems to be borne out by facts observed by physicians practising among the Jews. Tormay, Die Lebens- und Sterblichkeits-Verhältnisse der Stadt Pest, 1866.